Crowdfunding is a fantastic way to turn unique project ideas into reality and we want your help to transform shared spaces, inspire visitors and enhance Aylesbury Vale. We know many people have fantastic ideas to improve spaces and places around the Vale but they don’t always know where to turn to change their idea into reality. By partnering with Spacehive, AVDC are coordinating support from the crowd to connect and empower local communities and help you shape the Vale for the better. We have funding based on certain criteria available through the Our Vale fund, but through Our Vale we're also bringing together other funders and supporters who can pledge to your exciting projects as well. So, why not get creative, get innovative and get involved?! If you’ve got an idea or just want to support one then Our Vale could give your project the boost it needs to succeed. 1. Firstly, we've added some guidelines below (Eligibility) on the type of projects we're looking for and who is eligible for matchfunding. We want to help the Vale in as many ways as possible, but there are some ideas we can't support. To avoid any disappointment, make sure you have a read of this information before you begin! 3. Add your project to the Our Vale movement. When your project is created, it will automatically be matched to any relevant Spacehive movements. This match is based on the impact areas of the projects and the region in which the project is based. The owner of the movement can accept or reject projects. 4. Get verified. Before you can start fundraising, your project details will be verified by an independent organisation. This is an organisation called Locality who exist to help communities to change and improve. They will check that you have all necessary permissions to carry out your project. 5. Start fundraising. Get as many people as possible to show their support for your project by making a pledge - large or small, it doesn't matter. For us, the number of community backers you attract is as important as how much you raise. 6. Reach your target You must hit your crowdfunding target before your deadline to secure all of your pledges from the crowd. This is an 'all-or-nothing' model. your idea - why would it make a positive contribution to the whole community? Have you thought of alternatives? What are the strengths, weaknesses and risks? Why would others want to back it? the budget you require once you set your campaign target, you will need to deliver the project with the money raised. Get at least three quotes for large cost items. the roles in your team and the skills you require - what does each person bring and what else do you need to source from your community? people to engage with your project campaign building local relationships now will help you find support to help realise your project later on. bigger pledges to your campaign by offering people rewards if they pledge over a certain amount. For example, a guided tour of your project, or a one-off discount on your services/goods. local businesses to sponsor you or be a partner throughout the campaign: promotion for you and promotion for them! to create a Twitter page, website or Facebook page as soon as your project is up - people hear about your project through word of mouth, these will be the first things they search for. put someone in charge of social media promotion - this will be particularly helpful if you have a large/ambitious project and will be vital to your crowdfunding campaign. share the load: perhaps have someone looking after the budget and another the day-to-day management? host fundraising events which can get lots of local people involved: you’ll raise the profile of your project as well as raising funds and you will be able to demonstrate that you have broad local support for your idea. ask us or Spacehive if there have been similar projects to yours before. If there are, get in touch and ask them for their top tips/some advice. there will be ups and downs: during your crowdfunding journey, especially in the middle. Don’t be disheartened; this happens to most projects. Just keep going and aiming for the funding finish line. Be "not for profit" with clearly stated aims and objectives. The project must have a civic value and be open and accessibile to the community. Comply with Spacehive's terms and conditions. Retrospective projects (i.e. projects that will start before a funding decision has been reached or projects already completed). Expenditure already incurred or committed. Fundraising activities and events, or organisations fundraising for outward distribution to other service providers. Political or religious activities, or capital improvements to religious buildings. Projects outside of Aylesbury Vale. Projects involving membership-only organisations which exclude the general public (i.e. non members). This project seeks to help and integrate not only RAF Service children who face a number of challenges due to the innate mobility of their parents jobs and could have a parent who maybe an operational duty overseas but also the local community who are new to the area (at the newly built private estate Princess Mary Gate), by providing an improved and extended two children’s play areas and a multi use games area (MUGA). Currently there is limited or no equipment available at these sites, as older equipment has been removed as unsafe; an unsightly derelict car park dominates and separates military families and their civilian neighbours. Thank you to everyone who attended our project workshop yesterday afternoon at the Waterside Theatre. There was a great turn out with lots of interest, enthusiasm and project ideas! We hope the workshop helped inform your crowdfunding plans and we wish you the best of luck with your projects. Remember, if you need any help or questions answering, then just get it touch. Help make Aylesbury Vale the best possible place to live and work. 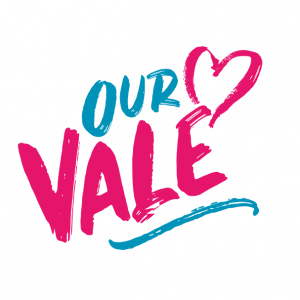 Our Vale is bringing together the local community to help shape the Vale for the better. Got an idea? Get it on Our Vale and give your project the boost it needs to succeed!